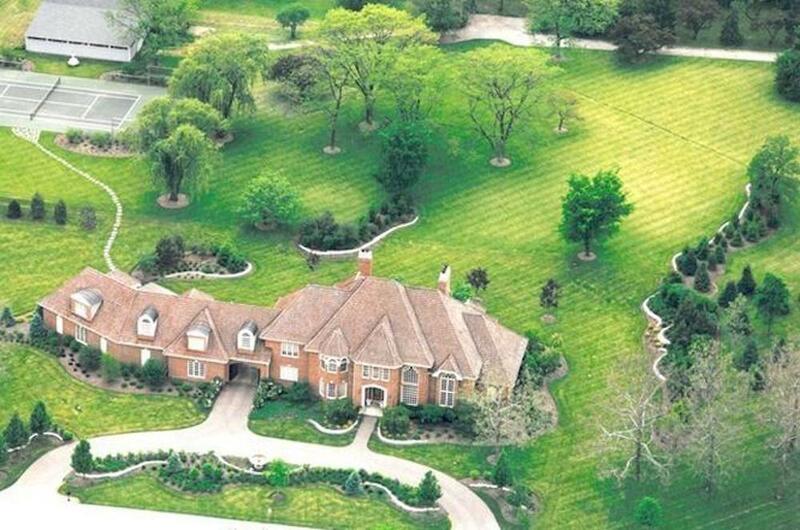 Sharon Lynn Barron and her husband, Kenneth L. Barron Jr., purchased 1334 Fox Glen Drive in Wayne for $875,000 in 1999, according to the Kane County Recorder. That would be $1.32 million in today's economy for an all-brick manor house on almost 2 acres, which includes six bedrooms, eight bathrooms, a six-car garage, stone-lined ponds, four fireplaces and a swimming pool. The Barrons were sued in 2007 by a former business partner who alleged that Kenneth Barron diverted millions of dollars from their joint businesses for his personal use. When Kenneth Barron died in 2012, the plaintiff continued the case against his estate, and was eventually awarded $3,220,702 for the alleged fraud and an additional $450,000 in punitive damages. Amid all their legal troubles, the Barrons listed their estate for sale in October 2009 for $3.5 million, according to Zillow. By October of last year, the price was down to $1.3 million. Sharon Barron finally sold the home on February 1 for $1.18 million, or $140,000 less than the present-day value of what she and her husband originally paid for it. Between 2002 and 2017, the Barrons paid $574,071 in property taxes – 49 percent of the home's sale price. While Sharon Barron's story isn't typical, her property tax plight is all too common in Kane County. Lily Lake, Wayne and Gilberts saw the highest effective tax rate in Kane County in the second part of 2018, according to an analysis by Local Government Information Services (LGIS), which publishes the Kane County Reporter. The effective property tax rate, or the percentage of your home’s value that you pay in property taxes each year, averages 2.31 percent in Illinois, three times the 0.87 percent tax rate in neighboring Indiana, according to WalletHub.com. Nationally, the average effective property tax rate is 1.3 percent. Of the 27 Kane County communities surveyed by LGIS, 24 have effective property tax rates higher than the state average. Lily Lake topped the list with a 3.65 percent effective property tax rate; Wayne was second with 3.35 percent, and Gilberts rounded out the top three with 3.16 percent. In September 2015, William and Tamara Georges paid $807,500 for a five-bedroom, six-bath home in Lily Lake, or $857,831 in today’s dollars. The home at 40W740 Timbergate Lane sits in a cul-de-sac on an acre of wooded land. It features beautiful millwork, a two-story great room, crown moldings, a four-season room with 14-foot knotty pine ceilings just off the in-ground backyard pool, and a three-car garage with a separate garage for a tractor. In 2006, another buyer paid $1.1 million for the home; so at first glance, the Georges' purchase looked like a bargain. However, Illinois' highest-in-the-nation property taxes have brought home values in the state tumbling down and eroded the home's equity. The Georges have had the home on the market for a year now with no takers and continue to lower the asking price. Originally listed at $799,000, the home is now down to $694,000 – $163,831 less than the Georges paid for the house (inflation adjusted). In the short time that the Georges have owned the home, they have paid $61,194 in property taxes. If the home were to sell at its current asking price, the effective tax rate would be 8.8 percent. Like the Georges, David and Jana Heckel know the feeling of sitting on a home that won't sell. They purchased their Gilberts home for $344,000 in 2005, or $453,362 in today's economy. They first listed 164 Gregory M. Sears Drive for sale three years ago, and it was on and off the market until it finally sold in January for $270,000 – $183,362 less than their original purchase price with the inflation adjustment. Between 2005 and 2017, the Heckels paid $105,800 in property taxes, which equates to an effective tax rate of 39 percent. Sources: Kane County Recorder of Deeds, Kane County Treasurer; Tracks all communities with more than ten sales from July 1-Dec. 31, 2018; Communities with fewer than five sales excluded.